Vivien Rayam serves Clearpoint as Senior Director of Business Development. She is responsible for managing a national business development team that expands Clearpoint’s mission of “consumer health through financial education” to underserved economic groups, including low- to moderate- income populations, Hispanics, veterans, and older Americans. Her team is instrumental in developing new and diverse revenue streams by forming strategic alliances with national corporations and nonprofits to further expand the agency’s footprint and reach. Located in Atlanta, GA, Rayam joined Clearpoint in 2018. She has previously served as the RVP for the Southeast Region for Operation HOPE. In that role, she worked with industry partners to meet the organization’s strategic goals. She held other roles including Director of Development and Strategic Planning for a victim services organization, and a Housing Director for a statewide homeownership program in Rhode Island. As a journalism major in college, she quickly learned the importance of telling a compelling story. 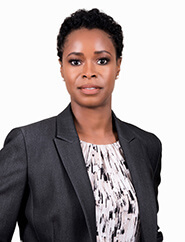 Her educational background also includes a Master’s in Community Economic Development and a MBA.